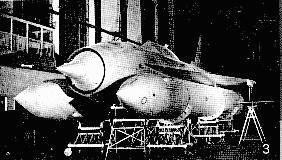 A government decree on 20 May 1954 authorized the Lavochkin aircraft design bureau to proceed with full-scale development of the Burya trisonic intercontinental cruise missile. 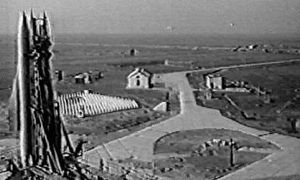 Burya launches began in July 1957. The project was cancelled, but the team was allowed final tests in 1961 that demonstrated a 6,500 km range at Mach 3.2 with the 2,350 kg payload. 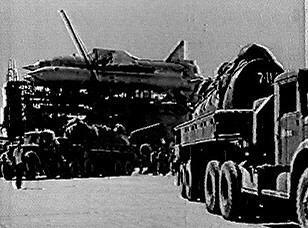 In cancelling Burya the Russians gave up technology that Lavochkin planned to evolve into a manned shuttle-like recoverable launch vehicle. AKA: La-350;La-X;Object 350. Status: Retired 1960. 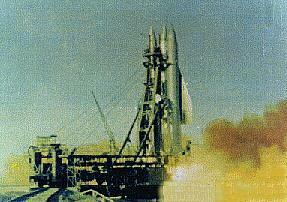 First Launch: 1957-08-01. Last Launch: 1960-12-16. Number: 18 . Thrust: 1,346.00 kN (302,592 lbf). Gross mass: 94,865 kg (209,141 lb). Height: 22.00 m (72.00 ft). Diameter: 2.20 m (7.20 ft). Apogee: 100 km (60 mi). 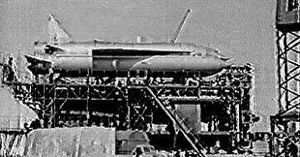 A final government decree on 20 May 1954 authorized the Lavochkin and Myasishchev aircraft design bureaus to proceed in parallel with full-scale development of trisonic intercontinental cruise missiles. Both missiles would use ramjet engines by Bondaryuk, astronavigation systems by R Chachikyan, inertial navigation systems by G Tolstoysov, and aerodynamics developed by TsAGI (Central Hydrodynamics Institute). Lavochkin's Burya would use rocket booster engines built by Glushko. Lavochkin's missile was to deliver a nuclear warhead of 2,100 kg over an 8,500 km range. The Lavochkin design used two rocket boosters derived from the R-11 'Scud' tactical missile. The Burya had a length of 19.9 m, a wingspan of 7.75 m, and a total design mass of 96 metric tons. The Lavochkin team was able to lead in the development, with preliminary design being completed in September 1955. By 1956 Myasishchev was just completing project design, while Lavochkin was already completing construction of the first missile. 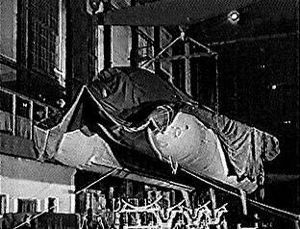 Then Lavochkin experienced a major setback in September 1956, when the payload requirement was increased from 2,100 to 2,350 kg. However the team persevered and production of flight test units began at Kuibyshev Aviation Factory 18. 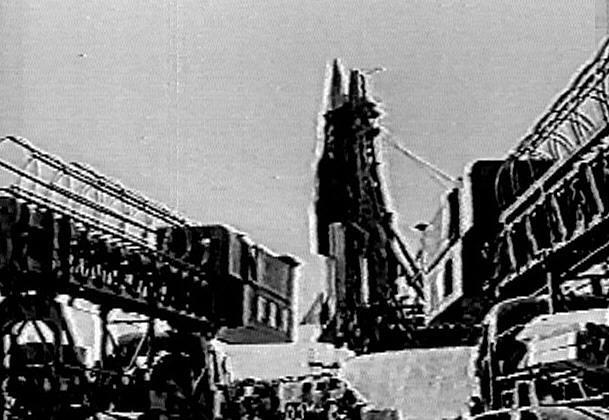 The missile transporter-erector was developed by Vladimir Petrov at KB TM. 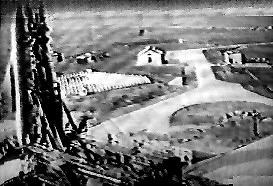 The elaborate launch facility was built at Vladimirovka, the Air Force test base south of Kapustin Yar. In the race to get in the air between Buran and Burya, Burya was launched first, in July 1957. The missile cleared the launch tower, then immediately arced over and crashed with a huge explosion within sight of the launch pad. But events now conspired against the project. The equivalent US Navaho was cancelled ten days later. Korolev's R-7 ICBM completed its first successful test flight in August. 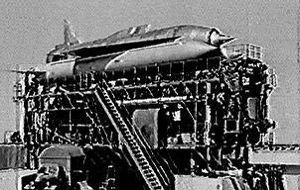 Myasishchev's Buran was being prepared for its first flight when that project was cancelled in November 1957. 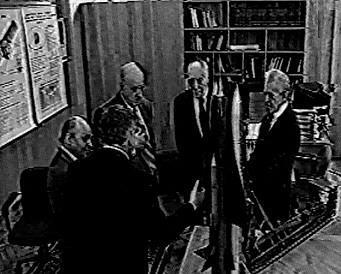 The Soviet leadership did not see any need for continued development of a parallel ramjet design. However development tests of the Burya continued. The first four tests worked out the vehicle dynamics up to the point of ignition of the cruise stage. By the 14th launch, on 2 December 1960, a 4000 km range was achieved. Later 6,500 km was achieved with cruise at Mach 3.2 with the 2,350 kg payload. Total missile mass as actually flown was 97,215 kg . Then the axe fell on Burya as well. 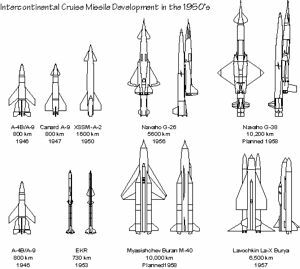 With development of ICBM's going well, and improvements in surface-to-air missiles, the intercontinental ramjet looked expensive and vulnerable by comparison. The Burya cancellation was a hard blow to the Lavochkin team. 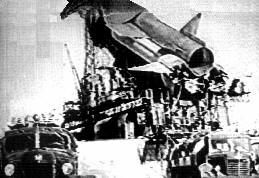 In cancelling Burya the Russians gave up technology that Lavochkin planned to evolve into a manned shuttle-like recoverable launch vehicle. Stage 1. 2 x Burya booster. Gross Mass: 27,000 kg (59,000 lb). Empty Mass: 4,000 kg (8,800 lb). Thrust (vac): 771.700 kN (173,485 lbf). Isp: 250 sec. Burn time: 70 sec. Isp(sl): 218 sec. Diameter: 1.45 m (4.75 ft). Span: 5.20 m (17.00 ft). Length: 18.90 m (62.00 ft). Propellants: Nitric acid/Amine. No Engines: 1. Engine: S2.1150. Status: Out of production. Comments: Booster for Burya missile. Two used to boost ramjet second stage to ignition conditions. Engines developed by Isayev from R-11 S2.253 engine. Early Buryas had S2.1100 engine. Masses estimated based on known total vehicle mass. Stage 2. 1 x Burya. Gross Mass: 40,865 kg (90,091 lb). Empty Mass: 13,000 kg (28,000 lb). Thrust (vac): 76.000 kN (17,085 lbf). Isp: 1,500 sec. Burn time: 8,500 sec. Diameter: 2.20 m (7.20 ft). Span: 7.75 m (25.41 ft). Length: 18.00 m (59.00 ft). Propellants: Air/Kerosene. No Engines: 1. Engine: RD-012U. Other designations: La-X, Objekt 350. Status: Out of Production. Boosted by 2 x R-11 derivative boosters. 6,500 km tested, 8,000 km specified, cruise at Mach 3.2 at 18-20 km altitude with 2,350 kg warhead. Flight tested 1957 - 1960. Wing area 60 square meters; diameter of ramjet inlet 1.7 m. Total missile mass 97,215 kg; gross masses prorated, empty masses estimated. Burya Ramjet missile stage. Boosted by 2 x R-11 derivative boosters. 6,500 km tested, 8,000 km specified, cruise at Mach 3.2 at 18-20 km altitude with 2,350 kg warhead. Flight tested 1957 - 1960. 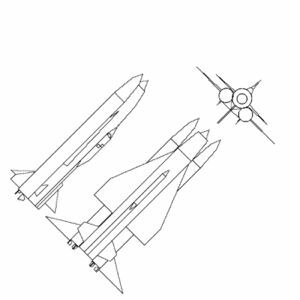 Wing area 60 square meters; diameter of ramjet inlet 1.7 m. Total missile mass 97,215 kg; gross masses prorated, empty masses estimated. Family: ICCM. Country: Russia. Engines: S2.1150, RD-012U. Launch Sites: Kapustin Yar, Kapustin Yar VLAD. Stages: Burya booster, Burya. Agency: Lavochkin bureau. Bibliography: 2, 344, 456, 474, 83, 95. 1957 August 1 - . Launch Site: Kapustin Yar. Launch Complex: Kapustin Yar VLAD. Launch Vehicle: Burya La-350. FAILURE: Launch abort..
Burya first launch attempt - . Nation: Russia. Apogee: 0 km (0 mi). Objective was limited to test of operation of first stage boosters. The AVD Engine Cutoff System activated on ignition due to destruction of an OT-155 propellant valve in one of the booster engines. The missile remained on the pad. The stage boosters were dismounted, checked, and reassembled. 1957 September 1 - . Launch Site: Kapustin Yar. Launch Complex: Kapustin Yar VLAD. Launch Vehicle: Burya La-350. FAILURE: Premature release of the jet vanes - missile cleared the launch tower, then arced over and crashed. Burya flight 1 - . Nation: Russia. Apogee: 0 km (0 mi). Objective was limited to test of operation of first stage boosters. After launch, there was a premature release of the jet vanes. The missile cleared the launch tower, then immediately arced over and crashed with a huge explosion within sight of the launch pad. 1957 October 30 - . Launch Site: Kapustin Yar. Launch Complex: Kapustin Yar VLAD. Launch Vehicle: Burya La-350. FAILURE: Failure. Burya flight 2 - . Nation: Russia. Apogee: 0 km (0 mi). 1958 March 21 - . Launch Site: Kapustin Yar. Launch Complex: Kapustin Yar VLAD. Launch Vehicle: Burya La-350. FAILURE: The flight continued only to T+63 seconds. Severe vibrations were encountered and the missile was unstable in flight. At T+60 seconds, the autopilot put the missile into a dive..
Burya flight 3 - . Nation: Russia. Apogee: 0 km (0 mi). Objective was limited to test of operation of first stage boosters. The second stage was a mass model (the tanks were filled with sand). The flight was planned to last 96 seconds..
1958 April 28 - . Launch Site: Kapustin Yar. Launch Complex: Kapustin Yar VLAD. Launch Vehicle: Burya La-350. FAILURE: Failure of an electric circuit led to premature cutoff of the boosters. Burya flight 4 - . Nation: Russia. Apogee: 15 km (9 mi). Cruise stage tanks 2 and 3 were filled with water, the engine feed tank was filled with propellant, and tanks 1 and 4 were empty. Mass was reduced by 30% from that of a fully fueled stage. The boosters were fully fueled. A slightly different turbopump was installed on the engines in comparison to earlier flights. The flight was to demonstrate simultaneous control of the missile using both aerodynamic surfaces and exhaust vanes after T+50 seconds. The flight continued to T+81 seconds, when failure of an electric circuit led to premature cutoff of the boosters. 1958 May 22 - . Launch Site: Kapustin Yar. Launch Complex: Kapustin Yar VLAD. Launch Vehicle: Burya La-350. Burya flight 5 - . Nation: Russia. Apogee: 17 km (10 mi). As in previous flight, cruise stage 30% below design weight, and propellant tanks mainly filled with water. The flight continued to T+120 seconds. The boosters worked normally and shut off at T+90.5 seconds, with the vehicle at 17.3 km altitude and flying at Mach 2.95-2.97. Simultaneously the ramjets of the cruise stage ignited. Stage separation was normal and the aerodynamic sensors and diffuser worked normally. 1958 June 11 - . Launch Site: Kapustin Yar. Launch Complex: Kapustin Yar VLAD. Launch Vehicle: Burya La-350. FAILURE: The AVD Engine Cutoff System activated at T+6 seconds due to a problem in one of the chambers of the boosters. Launch did not occur..
Burya launch attempt - . Nation: Russia. Apogee: 0 km (0 mi). Cruise stage tanks 2 and 3 and engine feed tank all filled with fuel. Tanks 1 and 4 were empty..
1958 July 3 - . Launch Site: Kapustin Yar. Launch Complex: Kapustin Yar VLAD. Launch Vehicle: Burya La-350. Burya flight 6 - . Nation: Russia. Apogee: 15 km (9 mi). Launched after prior 11 June flight attempt. The booster stage was replaced. 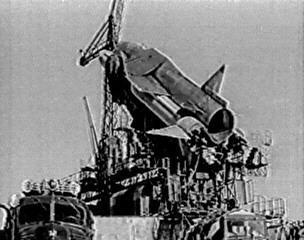 Controlled flight program ended at T+56 seconds due to damaged circuits connected to the autopilot..
1958 July 13 - . Launch Site: Kapustin Yar. Launch Complex: Kapustin Yar VLAD. Launch Vehicle: Burya La-350. Burya flight 7 - . Nation: Russia. Apogee: 15 km (9 mi). Cruise stage tanks 1 and 4 empty. The flight lasted only to T+96 seconds. At this point, duirng fseparation of the boost and cruise stages the vehicle became unstable and was unable to achieve level powered cruise flight..
1958 September 10 - . Launch Site: Kapustin Yar. Launch Complex: Kapustin Yar VLAD. Launch Vehicle: Burya La-350. Burya flight 8 - . Nation: Russia. Apogee: 15 km (9 mi). Cruise stage tanks 1 and 4 empty. 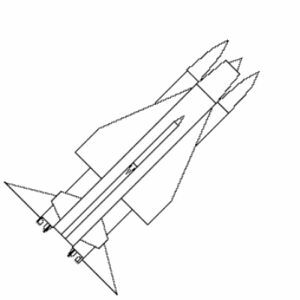 The boosters operated normally and the cruise stage ignited at Mach 2.95-3.0. At T+95 seconds there were problems at separation of the boosters, leading to cruise stage instability and an asymmetric airflow through the ramjet diffuser leading. This caused significant variations in thrust. 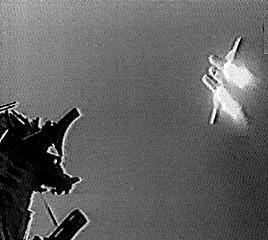 The pressure in tank 3 dropped at T+160s econds and the ramjet flamed out. 1958 December 28 - . Launch Site: Kapustin Yar. Launch Complex: Kapustin Yar VLAD. Launch Vehicle: Burya La-350. 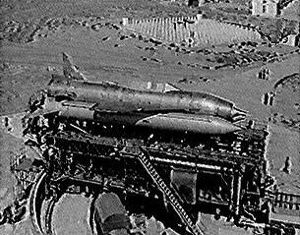 FAILURE: Vehicle broke up due to an explosion in the empty propellant tank..
Burya flight 9 - . Nation: Russia. Apogee: 15 km (9 mi). Cruise stage tanks 1 and 4 empty. 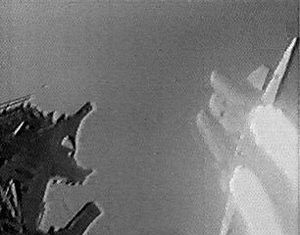 The flight continued to T+309 seconds, the longest to date, at which point the vehicle broke up due to an explosion in the empty propellant tank. The boosters operated normally but separation took place normally at Mach 3.3-3.4 (higher than expected). 1959 March 29 - . Launch Site: Kapustin Yar. Launch Complex: Kapustin Yar VLAD. Launch Vehicle: Burya La-350. Burya flight 10 - . Nation: Russia. Apogee: 15 km (9 mi). Cruise stage tanks 1 and 4 empty. The flight continued to T+25 minutes 20 seconds over a distance of 1,315 km. Booster stage operation and separation were normal, no vibrations were detected. The cruise stage ignited but the Air Sensor System (SVD) operated abnormally. As a result there was a reduction of velocity from that planned. 1959 April 19 - . Launch Site: Kapustin Yar. Launch Complex: Kapustin Yar VLAD. Launch Vehicle: Burya La-350. Burya flight 11 - . Nation: Russia. Apogee: 17 km (10 mi). Launched after prior 20 Februry flight attempt. The suspect booster was replaced. Successful flight lasting T+33.5 minutes, achieving a range of 1,766 km and a speed of Mach 3.15 at 17.0 km altitude..
1959 October 2 - . Launch Site: Kapustin Yar. Launch Complex: Kapustin Yar VLAD. Launch Vehicle: Burya La-350. Burya flight 12 - . Nation: Russia. Apogee: 17 km (10 mi). First flight with propellant in tank 4 of the cruise stage. Boosters featured an improved main engines without OT-155 valve (S2.1150 replacing S2.1100). 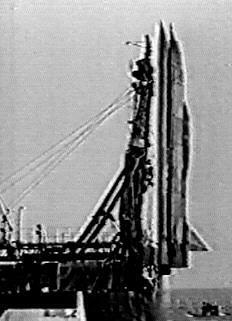 The cruise stage used the improved RD-012U ramjet in place of the previous RD-012. The first stage operated faultlessly and separation was normal without vibrations. Ignition of the cruise stage occurred at Mach 2.87 at 16.8 km altitude. The SVD Air Sensor System worked abnormally, so the decision was made to disconnect the SVD sensors and fly the mission using only the astronavigation system and hold inertial velocity to Mach 3.15-3.2. The flight continued to T+10 minutes 17 seconds and the planned flight program was completed. 1960 February 20 - . Launch Site: Kapustin Yar. Launch Complex: Kapustin Yar VLAD. Launch Vehicle: Burya La-350. Burya flight 13 - . Nation: Russia. Apogee: 15 km (9 mi). Planned to fly complete course with astronavigation system. Missile successfully flew 5,500 km..
1960 March 6 - . Launch Site: Kapustin Yar. Launch Complex: Kapustin Yar VLAD. Launch Vehicle: Burya La-350. Burya flight 14 - . Nation: Russia. Apogee: 15 km (9 mi). Planned to fly complete course with astronavigation system. Engine operation was rough due to high angle of attack (5-8°) of the diffuser. As a result, the flight was terminated at T+26 minutes after the missile had flown 1,500 km..
1960 March 23 - . Launch Site: Kapustin Yar. Launch Complex: Kapustin Yar VLAD. Launch Vehicle: Burya La-350. Burya flight 15 - . Nation: Russia. Apogee: 25 km (15 mi). Planned to fly complete course from Vladimirovka to Cape Ozerniy. Launch mass of the booster stage was 97,215 kg, and that of the crusie stage 34,680 kg. The second stage ignited at Mach 2.85. The booster stage engines cut-off at Mach 3.2. Stage separation occurred normally at T+101.3 seconds. The cruise stage astronavigation system acquired its guide stars at T+114 seconds. The cruise stage began level flight at 18 km altitude. The vehicle flew along its assigned 6,500 km route for 2 hours 4 minutes at an altitude of 18-24.5 km at Mach 3.2-3.15. 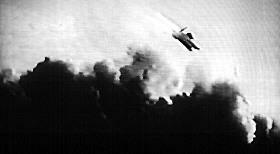 At T+118 minutes, with the fuel completely exhausted, the ramjet flamed out. At T+121 minutes power was transferred to the emergency batteries and the vehicle was issued a destruct command, but the rudders did not work. Flight with a steady loss of altitude continued to T+124 minutes. 1960 December 16 - . Launch Site: Kapustin Yar. Launch Complex: Kapustin Yar VLAD. Launch Vehicle: Burya La-350. Burya flight 16 - . Nation: Russia. Apogee: 15 km (9 mi). Test of AN-2Sh astronavigation system capability for flight in both daytime and nighttime conditions. The missile flew a range of 6,425 km at Mach 3.1-3.2. 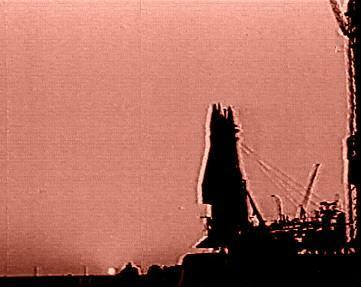 The flight was only terminated when the cruise stage used up all of its propellant..